With the Donald Trump government not acting or making any changes to its tariff announcements, the trade war between the US and China is well and truly on. 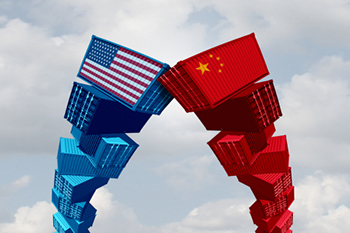 With effect from July 6, 2018, the higher tariffs become effective on Chinese imports into the US worth $34 billion. With the Donald Trump government not acting or making any changes to its tariff announcements, the trade war between the US and China is well and truly on. With effect from July 6, 2018, the higher tariffs become effective on Chinese imports into the US worth $34 billion. There is no denying the fact that China will react as they have already warned. China in turn proposes to impose tariffs on $50 billion worth of US imports. The direct impact of tariffs will be on good worth more than $100 billion and the downstream and collateral effects will be much larger and will only be evident in the days to come. The trade war was first triggered when Trump unilaterally announced 25% tariffs on steel imports and 10% tariffs on imports of aluminium. While the tariffs were broad-based and country-agnostic, the real target was always China. That is hardly surprising considering that the US runs a trade deficit of $376 billion with China. In fact, Trump’s complaint has been slightly larger. According to Trump, America has been short-changed by China in two ways. Firstly, the Chinese government gives its domestic producers enormous subsidies, which enables these producers to supply goods at rates that other countries are not able to match. That gives China an unfair advantage when it comes to global trade. The second complaint has been that China has been misusing intellectual property (IP) and has been using reverse engineering to build its own domestic industry in high technology areas. Trump has already warned that this could only be the beginning of his tariff attack on China. This $34 billion will be increased by another $16 billion within two weeks time. Post that Trump has planned two more rounds of tariffs covering Chinese imports worth $200 billion and $300 billion, which have been kept in abeyance as of now. The moral of the story is that if the situation does not get rectified to suit the US, then the actual coverage of tariffs on Chinese products could go as high as $550 billion. Not that China is likely to lag behind. In fact, Chinese counter tariffs to the tune of $50 billion will immediately take effect. Where exactly will it hit both these countries? As far as the US is concerned, the real imports are industrial products as depicted by the long green graph. China being the largest exporter of metals and industrial products to the US will be the worst hit. The idea is to clearly hit China at its manufacturing base, which actually creates the jobs in China. On the other hand, China will be hitting the US on agri imports essentially soybeans and pork. China will try to hit two birds with one stone. On the one hand, agriculture is a lot more job creating and politically sensitive lobby in the US. That will mean Trump’s own Republicans may be up in arms against the trade war. Secondly, most of the products have been selected in a way as to impact the core voter constituency of Trump. That could also have larger political ramifications. How will the trade war impact the world economy? China has already called this the biggest and most aggressive trade war in history. Here is how it will impact the financial markets. 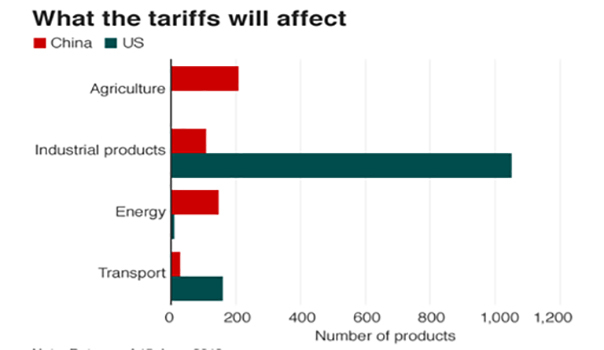 Oxford Economics has estimated that the impact of the tariff war on the US and Chinese GDP growth will be a maximum of 0.2% per annum. Considering these two economies have a combined GDP of $32 trillion, that straightaway shaves away close to $64 billion from the annual global GDP. Considering that these two economies are among the largest trading partners for most economies (outside of oil), the overall secondary impact will be much larger. If Trump eventually goes the whole hog and imposes tariffs on imports worth $550 billion from China, then the impact on US inflation could be big. Expensive Chinese imports will be a classic recipe for higher inflation. That will mean higher yields and a case for more hawkish Fed policy. Emerging markets will have to worry about capital outflows in that case. China, if pushed to the wall, has the potential to inflict substantial damage on the world economy. A slowdown in the Chinese economy will be felt by primary producers around the world as China is the single largest consumer of every conceivable product. The slowdown could be transmitted rapidly. Not to forget that China holds $1.3 trillion worth of dollar bonds. Any decision to sell even a small portion of these bonds will mean sharp swings in financial markets. But the biggest risk could stem from a weak yuan, at least for countries like India and other EMs. 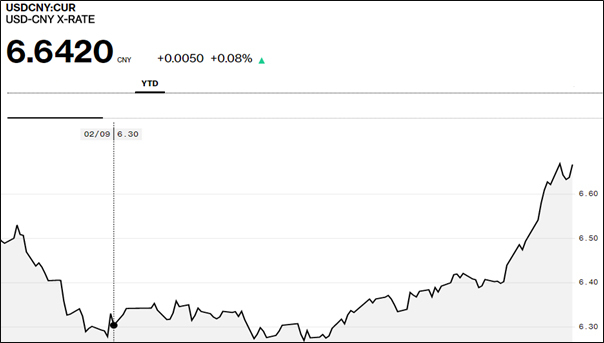 The yuan has been weakening against the US$ since the beginning of the current calendar year. Consider the chart below. A weak yuan will force most of the other EMs and even developed nations to weaken their currency to remain competitive in trade. That is the point at which this could actually degenerate into a full-fledged currency war. That is what the world markets need to be cautious about!